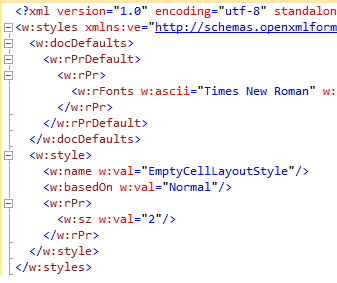 By now we’re used to products which emit docx files which are umm, not .. quite .. right. But its more noteworthy when the product in question is from Microsoft. After all, its their file format (ECMA etc standardisation notwithstanding). The product in question here is SQL Server Reporting Services 2012 and its Word export. But the problem is that it is actually setting them to blank (as opposed to zero), which is not valid. There are other problems with SSRS docx which the Productivity Tool doesn’t report. It’d also be nice if it defined the “Normal” style it is basedOn! docx4j and other consumers could/should detect such problems and degrade gracefully in the face of them, but Microsoft (of all companies!) should exercise better quality control. You are currently browsing the docx4java aka docx4j – OpenXML office documents in Java weblog archives for May, 2014.